A book about a guardian angel who protects people and improves their lives. This book was an ARC, courtesy of NetGalley. Gabby is new to town. Her family has moved again because her older brother, Marco, is getting moved to another hospital. Marco has an illness with a very complicated name so Gabby just calls it the bad. Aria is a guardian angel. She is sent to earth to take care of a person until true happiness returns to their life. Aria meets Gabby in a hospital and they become friends. Both of them are new to town and they have some classes together in their new school. Gabby convinces Aria to try different after-school clubs and the only one Gabby likes is choir. They both audition and make it into the club. All this time, Marco’s health is deteriorating. Gabby is losing her self-confidence and Aria is worried about her. Aria tries to help but when Marco gets seriously ill, there’s nothing she can do. 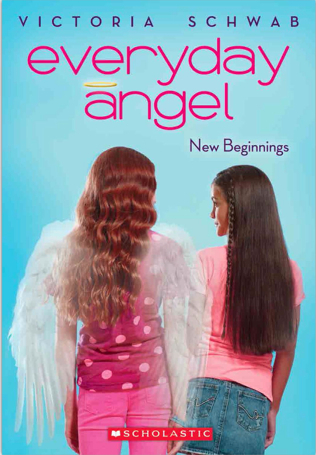 One day, Aria tells Gabby her secret: she is an angel. Instead of the surprised reaction Aria expected, Gabby gets mad at Aria. Gabby believes that since Aria is an angel, she should be able to heal Marco. Aria tries to explain to Gabby that it doesn’t work that way but Gabby refuses to listen. Will Marco get better? Will Gabby and Aria remain friends?